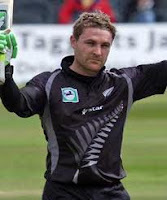 Brendon Mccullum Brendon Barrie McCullum (born 27 September 1981 in Dunedin) is a New Zealand international cricketer, who plays for the Otago Volts at provincial level. He is a wicket-keeper, as well as an aggressive batsman who opens in One-day Internationals and is known for his fast scoring rate. His brother Nathan McCullum is also a first-class and international cricketer at provincial level, and their father Stuart McCullum was a long-serving first-class player for Otago. Both Brendon and Nathan attended King's High School, Dunedin. McCullum also played for Kolkata Knight Riders in the Indian Premier League in the first three; but in 2010, he was signed in by Kochi Tuskers Kerala. He scored 158 not out in the inaugural match of the competition on 18 April 2008. The innings is currently the world highest score by a batsman in a Twenty20 match. "Brendon Mccullum" content is verified by the author and is may be accurate.If you find anything outdated on "Brendon Mccullum" please feel free to leave comments below.